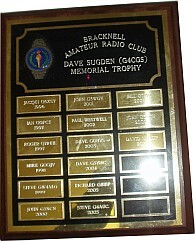 The Dave Sugden Memorial Trophy is awarded annually at the discretion of the committee to the member of the Bracknell Amateur Radio Club who has contributed in the most signficant way to club activities or amateur radio in general. 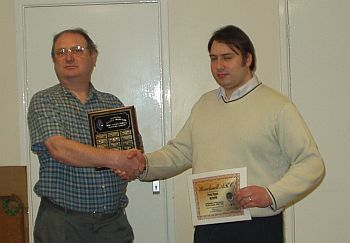 Dave Sugden G4CGS was a former member of the club and the trophy is in commemoration of his life. It is presented annually at the AGM. Nominations for recipients should be sent to a committee member by December so that the committee can arrange for engraving of the trophy in time. The trophy is highly treasured by its lucky recipients.